With the bee population struggling in many places, every little bit helps and you can make a difference in your own backyard. Maybe you’re not ready for the time commitment of keeping a full hive, but you still want to help the bee population thrive and even enjoy the benefits to your garden at the same time. Sound like you? Let’s look at a few ways you can help the bees on their journey without maintaining beehives in your backyard. We’re all so busy in our day to day lives that we often forget the simplest step to help our pollinating friends. Just planting blooming things in your yard, garden, window boxes and small pots you’ll be helping the ecosystem overall. You’ll have pretty blooms to look at, the bees will have places to forage, your neighbors might be jealous of your beautiful landscape and inspired to plant their own as well – it’s just a win all around. If you want to keep all the pollinators happy, plant nectar rich wildflowers and rotate varieties that will grow at different times throughout the season. I also like to sprinkle a little milkweed in the corners of my garden beds for the butterfly larvae feed on. So far it seems to be helping in my little corner of the neighborhood, every year over the last three years we have seen an increase in our butterfly population. A bee out foraging will fly in a radius of 2 to 6 miles around it’s hive area in search of nectar sources. That’s a lot of exercise in a day. You wouldn’t want to go on a 6 mile walk or jog without being properly hydrated. Hydration is equally important for our flying friends, especially during heat and drought situations. In populated areas fresh water sources for the bees and other insects can be difficult to find. Sure, there’s the occasional bird bath, but there are no streams or springs for them to visit. Setting up a rest station for our pollinating friends can simple and easy to do. Just a shallow bowl with some rocks and water where they can land to take a break and have a drink is all you need. Ideally, leave this dish near a flower box or next to the garden so it’s on their path and easy for them to find. Sure, right now the bees need our help to thrive and grow their numbers again, but they’re also very capable of taking care of themselves in most situations without our interference. 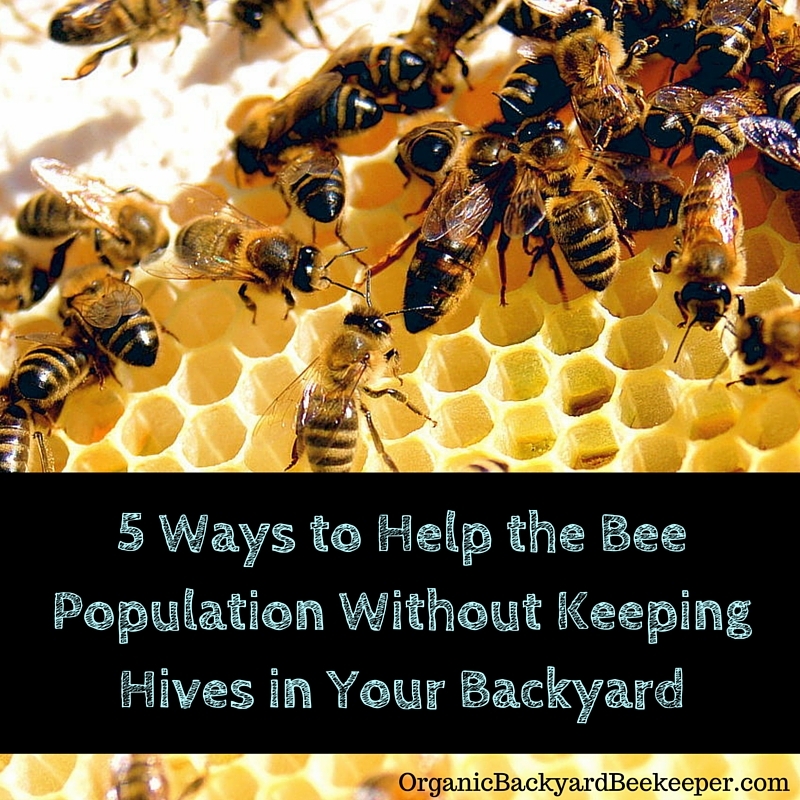 Just because you’re not ready to keep full hives doesn’t mean the bees can’t live in your yard. Set up a bee hotel of sorts in a tree on your property and before you know it you’ll have a nice little population flying by on their own. Some of these bee houses and insect hotels are quite decorative, too. It doesn’t get much easier, just hang one in a tree and you’re done. All the benefits of bees in your garden without the hard work and the smokers. The bees might bless your garden beds a little extra this year if you have a bee house and one of those resting water dishes nearby. If you are growing things in your yard of flower boxes, just say no to pesticides and chemical treatments. If your plants need a little boost or are being eaten by unfriendly insects there are organic options available that are quite effective and actually cost much less than those rotten chemicals. Fertilize with compost . Make friends with diatomaceous earth . Take things an additional step further and just say no to those who use them. Be mindful of where you buy your produce and support those who have ethical and sustainable farming practices. Of course, shop local whenever possible. If beekeeping is allowed where you live, chances are someone out there is doing it. Some locations even have active “Adopt-a-Hive” programs. Find a local hive keeper and reach out to see how you can help, whether it be by volunteering time, offering donations, or just placing an order for some honey with them. Additionally, stay educated and get involved where you can. Be aware of local ordinances, support local farmers and see if there are any beekeepers in your area that you can support by purchasing honey and other goods.